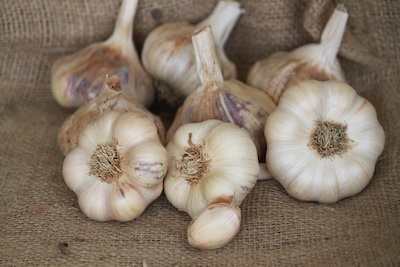 A popular "artichoke" garlic that has a soft neck ideal for braiding. These bulbs easily grow to 3" with 9-20 cloves each! The mild flavor is great for roasting and general use. Feed, water, and weed well for the best yield and bulb size. Stores easily for 6-9 months. Approx. 80 cloves per lb. Organic. Fall Ship.